That's great! We are a fast-moving, hard-working, socially conscious organization that rewards its team members based on performance. We take pride in making HR Avatar the kind of place where every team member knows he or she can make a difference. We exist to help our customers make the best possible hiring decisions. The trust we receive from our customers is our most precious asset. To maintain this trust, we insist on absolute integrity from every team member. In return for their dedication to serving our customers, we are committed to long-term employee growth and well-being. Our service is a team effort in which all team members deserve to share in the rewards of success. To remain competitive, we promote continual improvement and innovation in all dimensions of our business. 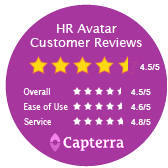 HR Avatar offers performance-based compensation for many positions, including an employee profit-sharing plan for full-time staff. If our values resonate with who you are, please review the openings below and apply online if any position seems right for you.